With their peg legs, their parrots and the skull and crossbones flying from the mastheads of their ships, classic pirates are some of the worlds best-known and easily recognizable outlaws. Or are they? These fifteen stories spin new tales of pirates crossing dimensional barriers for revenge, fighting terrible foes in outer space and building new lives after the Trojan War. Travel to the South China Sea, then on to New York City after a climate apocalypse, then roam the Caribbean during the Golden Age of Piracy and voyage to distant and fantastical worlds. Go with them as they seek treasure, redemption, love, revenge and more. Raise the Jolly Roger and sharpen your cutlass (or recharge your raygun) and climb aboard for some unforgettable journeys. Scourge of the Seas of Time (and Space) is a wonderfully varied anthology of short stories that was a delight to read. As the title suggests, it covers a range of time periods and genres, from ancient history through to future Earth and into entirely different worlds. Overall, it leaned towards fantasy and pirates of the sea, but there was enough of a mix to prevent boredom. Queen of Swords Press has historically been very supportive of diverse work, and it shows in this anthology. A number of stories featured f/f romantic elements and one particularly memorable story (Serpent’s Tale by Mhari West) features a poly triad set in Viking times. It also includes characters from a range of backgrounds, with some of the real-world stories being set in the Caribbean, South-east Asia and Colorado. This inclusivity not only reflects the state of the world, but served to keep the stories interesting. In addition to the variety of settings, there was also a reasonable variety of tone. It ranged from the fun and wacky to darker stories of revenge and those that embraced the grimmer parts of pirate history. However, on the whole it tends towards the lighter end of the spectrum and threats of sexual violence are distant where present. One trope that I saw a little more often than I would have liked was the exceptional woman–the one woman on an otherwise all-male crew. By and large, it was handled well, but it was an uncomfortable default, particularly in stories with fantasy settings. I was unsatisfied by a few stories that felt like a chunk of a larger story and lacked proper closure. This is something of a personal bugbear and will not be true for all readers. However, other stories in the collection also felt like they were part of a larger story but still managed to give proper closure to the tale they were telling. A particularly good example of this was the closing story Search for the Heart of the Ocean by A.J. Fitzwater, in which Captain Cinrak the Dapper, capybara pirate extraordinaire, goes on a quest to retrieve a jewel to replace the one she set free from the Queen’s tiara in a previous story. The overall quality of the stories was good, though there were one or two that weren’t at the same standard as the others. A couple of my favourites were the opening story Treasured Island by Ginn Hale, in which a pirate is marooned on a sentient island and finds peace in living close to nature, and Andromache’s War by Elliott Dunstan, which tells of what happens to Hector’s wife after the sack of Troy–a fierce story about a woman no longer willing to be powerless in the face of men’s war. 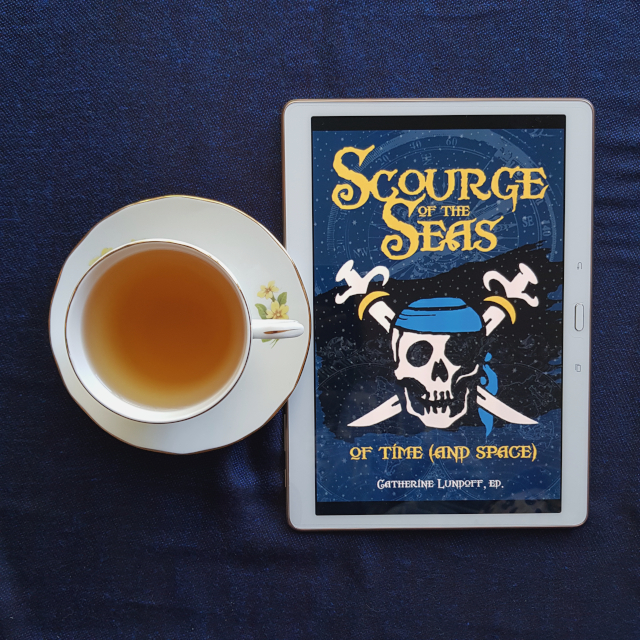 All in all, Scourge of the Seas of Time (and Space) is an anthology with heart and was a welcome read in stressful times. Oh this does sound fun — I love pirates and pirate stories! I’m surprised I didn’t immediately think of you, given your great love of Black Sails! I think you would enjoy this too.